You may have expected my next blog post to focus on my recent European adventures. Promise that you'll get your fill of Budapest and Vienna soon, but I have to admit that being away always makes me appreciate home and New York City all the more. So, I thought it only right to start this month with a look at another one of my NYC go-to's: French Louie, the Atlantic Avenue bistro sister to the down-home Carroll Gardens fave Buttermilk Channel. The restaurant's entryway bar is welcoming and, if the weather mild, French Louie's expansive backyard patio is an irresistible spot to share a bottle of Picpoul de Pinet, order the kitchen's heavenly Gougeres and end up lingering over a leisurely dinner that ends with glasses of chilled Poire Williams -- or come when the sun is shining and tuck into a well-earned weekend brunch. 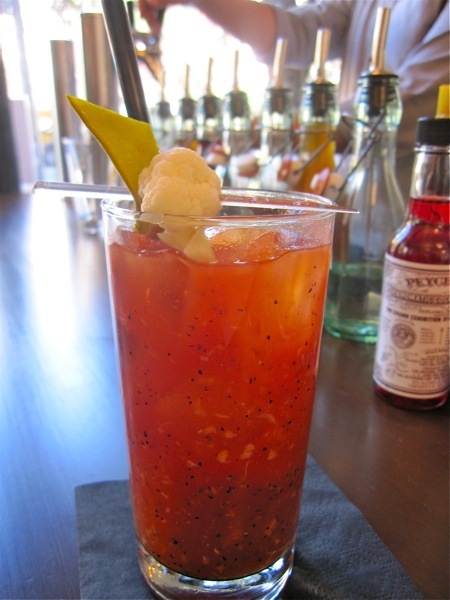 Considering the Bloody Mary snapshot above, you can safely assume that I'm going to talk more about the latter. And, since the photo is of one of the most classic brunch cocktails around, you might assume that French Louie focuses on the classics as well, albeit with a Parisian accent. This assumption would be incorrect. No Croque Monsieur or baskets of Croissants here. Why should there be, when the kitchen can instead bring you a petite dish filled with warm Orange Madeleines fresh from the oven? Or if that sounds too conventional, how about something from the garden? 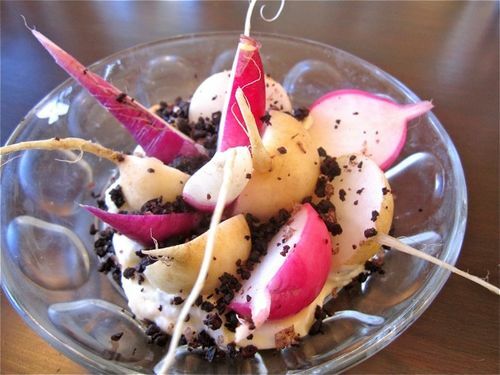 Order up a small plate of deep pink, crisp radishes, ready to dip into creamery butter that's been showered in black olive shavings. So simple, but this addictive combination is crunchy, bitter, rich, sweet and salty all at once. 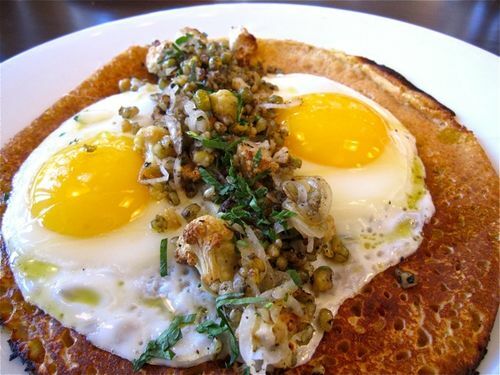 And, if you didn't get enough of a veggie fix with that starter, perhaps you'll need to try the Socca, a savory chickpea pancake topped with bits of roasted cauliflower, nutty freekeh, slivers of sauteed onion, chopped herbs and two perfectly cooked sunnyside-up eggs. Must admit that this Mediterranean delicacy, by way of the Côte d’Azur, had never been on my radar screen before dining at French Louie. Now I wonder why it isn't on restaurant menus across the city. Classics do emerge on the menu from time to time, but usually with a twist -- as with the restaurant's Cordon Bleu, a Gallic staple reinvented with a nod to culinary traditions below the Mason-Dixon Line. 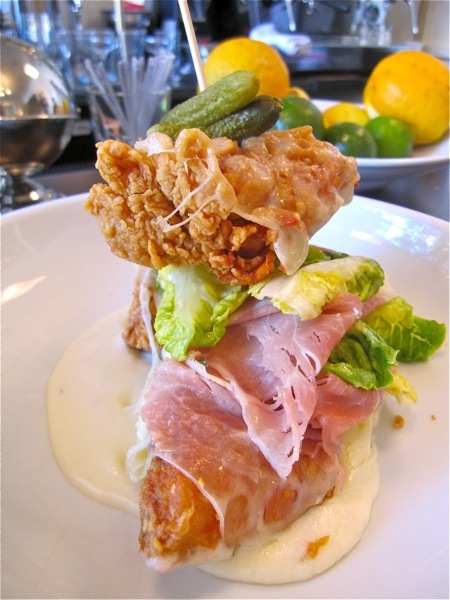 It's a gobsmacking tower of succulent fried chicken breast, thin slices of Benton's country ham, melted Gruyere, decadent Mornay sauce and a leaf or two of Bibb lettuce so you can pretend that there is some small part of this dish that's healthy. Let's be clear: healthy this is not, but delicious it is. My recommendation? Bring along a few friends to attack it with you and then walk across the Brooklyn Bridge afterwards. Then make plans to return for dinner, when -- thank goodness -- the dish isn't on the menu and you can turn your attention to lighter fare like a Roasted Carrot and Beet Salad with a Pistachio and Coconut Vinaigrette or Flounder Grenobloise. Then again, the Pork and Rabbit Rillettes sounds pretty good, and so do the Anchovy Frites with Crispy Lemons and Aioli. Maybe I should just start walking across the Brooklyn Bridge now.